In the heart of Milan's renowned Piazza Duca d'Aosta resides the Excelsior Hotel Gallia. Opened in 1932, this luxurious grand hotel, with its dominant and memorable art nouveau façade, has been recently refurbished to retain its reputation as one of the best in Italy. 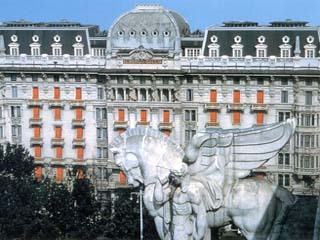 The Excelsior Hotel Gallia - A Royal Méridien Hotel, with its imposing facade, is a truly historical landmark five-star deluxe hotel. The Excelsior Hotel Gallia has an excellent location, overlooking one of Milan's most characteristic squares, Piazza Duca d'Aosta which is only a short drive from the city's cultural and financial center. 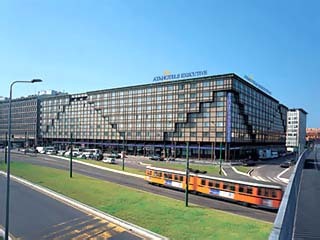 Convenient for travelers, tourists and businessmen, the hotel is close to the central railway station (Stazione Centrale) and the airport terminal. The city centre is only 20 minutes walking distance from the Hotel. Its many attractions include the Teatra alla Scala, which dates back to 1778. The Pinacoteca di Brera, founded by Napoleon, contains works of art by Italian artists, as well as displaying many Venetian and Lombard masterpieces and works by Rubens and Rembrandt. Milan is also home to Santa Maria delle Grazie and Il Cenacolo Vinciano (The Last Supper by Leonardo de Vinci). The Duomo and the Galleria Vittorio Emanuelle II are favourite meeting places of the Milanese and the Via Montenapoleone and Via della Spiga are two of the most famous streets in Milan with numerous designer shops. Ten minutes by taxi is the Sant Amrogio Basilica built in 386 AD. For a wider perspective of the region, the sea at Liguria, the mountains (the Alps) and the lakes Como and Garda are one hour's drive away. The Hotel offers 237 spacious Rooms, including 13 Suites (41 non smoking), all of which are luxuriously decorated in pastel shades with tinted windows, marble Bathrooms. Blue light at the window and the warmth of a room where every detail seems to whisper your name it is time to relax. A busy day behind you other opportunities tomorrow, but now it is time to slip off your shoes because you are at home. Standard - these rooms are located in the Pirelli wing of the Hotel, some of which overlook the square. They have queen-size, king-size or twin beds with marble Travertino Bathrooms. It is possible to arrange for an extra bed. Superior - newly refurbished rooms both in the historical wing and the Pirelli wing of the Hotel. A trendy design incorporating mirrors and an exclusive, embossed fresco near the bedside, together with distinctive furnishings and finishing touches creates a unique mood that is both modern and elegant. The Bedrooms have queen-size, king-size or twin beds and some rooms have a bay window and/or balcony. It is possible to arrange for an extra bed. Deluxe - the majority of the rooms overlook the largest square in Milan, Piazza Duca d'Aosta and are located in the historical wing of the Hotel. The room design reflects the Liberty style apparent in the furniture design, the use of pastel colours, wood panelling and the superb marble bathrooms with Venetian-style coloured windows. Some bathrooms have a separate toilet and shower. Some of the rooms are more traditional with classic, timeless furniture and decoration. With queen-size, king-size or twin beds, some rooms have a bay window and/or balcony. Executive Suite - the sitting rooms and bedroom have been recently redecorated with classic furniture, surrounded by warm colours, which create a pleasant atmosphere. Rooms have a king-size bed, L-shaped suite with a separate sitting area and a full-size sofa bed. 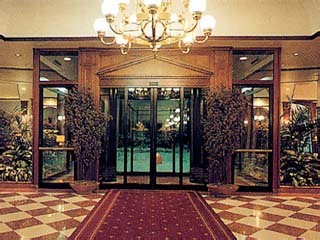 All Executive Suites are in the historical wing and overlook the square. Junior Suite - located on the corner of the Hotel in the historical wing, these suites have a spacious living room and bedroom with a bay window. The walls are decorated with light pastel colours and the superb marble bathrooms reflect the Liberty style. One Bedroom Suite - available in two different styles, Liberty and traditional, all these suites have a balcony overlooking the square. With private entrances for the living room and bedroom, the suites have king-size or twin beds. A few parlours have a separate bathroom and it is possible to connect the parlours to an additional bedroom. These suites are ideal for a small meeting or private dining for up to eight people. Gallia Suite - dedicated to the Gallia family, the founders of the Hotel 70 years ago, the Gallia Suite is a unique suite with a large living room, exquisite ceiling decoration, antique mirrors, old-style furnishings, Flemish paintings, private bathroom and a balcony overlooking the square. It is connected to a same style room. Restaurant Gallia - offers a wide choice of refined Italian, Mediterranean or Lombardy dishes, masterfully prepared by chef, Augusto Paleni. 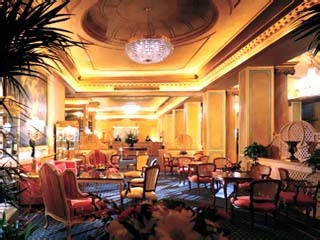 The Baboon Bar - serves beverages in a refined and intimate atmosphere, accompanied by gentle background piano music.